During the Tang Dynasty, horses brought from the West by way of the Silk Road were highly coveted by the high-ranking officials and the nobility. The illustrated horse has long, thin legs, from which it is assumed to be a breed from the West. One of its front legs is held up high, and its neck is twisted, as if the horse were dancing. The observant eyes, the flaring nostril, the texture of the taut skin around the bridge of the nose and the nose tip, all suggest the look of a fine horse. The mane is realistic, and the saddle and other trappings are decorated beautifully and delicately. The horse was made in several parts using molds which were luted together and refined to its final shape. It was then fired, covered with white slip, and carefully painted using red and green, and in some areas, gold pigments. It is said that in the Tang dynasty, horse dance, in which the horses were made to dance to music, was popular. 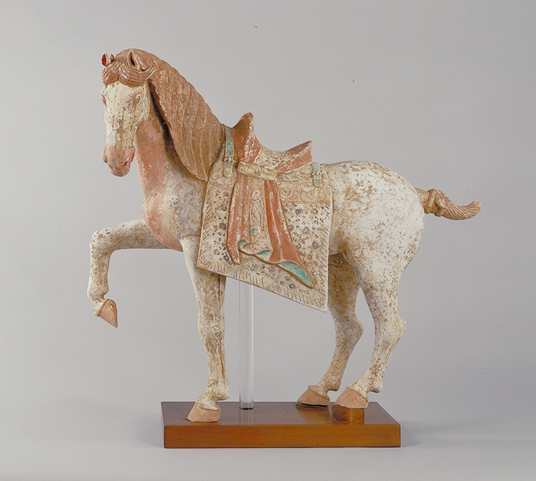 This horse, suggesting that long-ago custom, was made in the latter seventh century, when the best of the painted Tang tomb figures were produced.